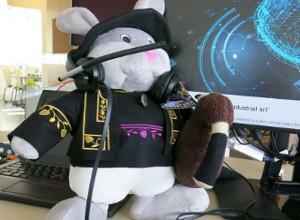 Skouarnhir (long ears in Breton language) is the IoT.bzh mascot. This carater was created by ELB in Kemper and was crafted 100% in Britanny by three local companies, which perpetuate the knowlege of Breton crafts and love of work. The decoration of his traditional costume is representative of Bigouden area (Pont L'Abbé).